Bacon makes anything taste great! That could be true, but I haven’t tried it with everything yet. We’ll all hopefully find out someday. All I could say is, I think I may have found something that could give crispy bacon a run for its money. Let me introduce you to crispy Jamon Serrano, a Spanish cured ham, which literally means Mountain Ham as it’s cured at high elevations. I don’t know what makes it taste great, either the crisp mountain air, or what the pigs are fed, or just the amazing marbling of the meat; either way I prefer it to Italian Prosciuttto. Don’t get me wrong, prosciutto tastes great! I just prefer the flavour of Jamon Serrano. So, yet another idea lingers in my head after work about creating something exciting. This time, I wanted to work with scallops. I went to the local grocery store, bought a pack of scallops, and wandered around in search of ingredients to combine it with. I decided to get some Jamon Serrano, about 100g of it, as well as some chorizo. When I got home, I sliced the chorizo and set it aside. I heated the pan, coated it with a little bit of butter and placed the Jamon Serrano slices in. It immediately curled up, so I took it out and kept it aside. I couldn’t resist having a taste, so I took a piece and it was so crispy and tasted so flavourful. Bacon tastes great, but this was just as awesome. I then added more butter to the pan, added some saffron threads, garlic, black pepper, paprika, ground cayenne, and white wine, and seared the scallops. 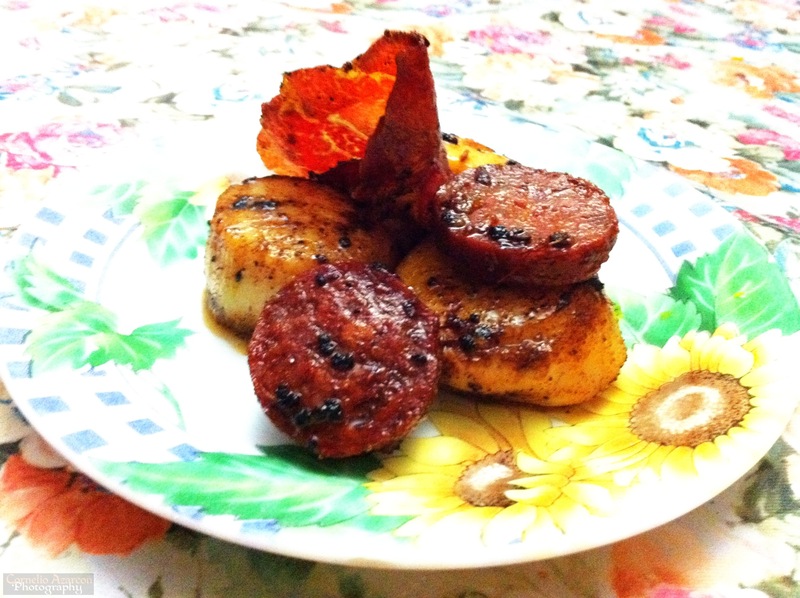 While all the scallops were cooking, I added the sliced chorizo to the mix. Note, you don’t have to add salt since the Jamon Serrano and chorizo are both salty, so the scallops would take the flavour from the drippings in the pan. Overall, the combination of the scallops, Jamon Serrano, and chorizo are a perfect match, and the addition of the saffron threads gives it a Spanish feel to the dish and would be great to be served as tapas. Alternatively, if you cannot find Jamon Serrano, you can use prosciutto, or even if you prefer the latter over the former, go right ahead. If you also prefer using regular sausages, go right ahead, it’s your lab experiment now. Just let me know if you think that Jamon Serrano or prosciutto could give bacon a run for the title.